Delta Broadcasting Service, DBS Warri Chapter of Radio Television Theatre & Arts Workers Union of Nigeria, RATTAWU and Nigeria Union of Journalists, NUJ, have petitioned the Delta State House of Assembly Committee on Information, alleging that the General Manager of Delta Broadcasting Service, DBS Warri, Mr. Tunde Omonode Igrammar fleeces the Delta State Government owned media by surreptitiously employing “three casual staff as secretaries into the three key departments that control the funds of the station- Office of the General Manager, Accounts/Finance and Marketing, in a bid to cover up his fraudulent acts”. The petition which was released to Fresh Angle International via Electronic Mail Thursday April 11, purported that the Account Department of the station is loaded with members of one family and friends, while revenues from several commercial programmes and advertisements are allegedly paid into individual accounts belonging to the General Manager, Mr. Tunde Omonode, Deputy General Manager/HOD Accounts/Finance and Deputy General Manager/HOD Marketing, thereby violating approved financial regulation. They accused Mr. Igrammar of taking DBS Warri 30 years backward and deliberately refusing to step down in connivance with top echelons of the State Ministry of Information, even though his tenure has since elapsed. According to the unions, DBS Warri under the reign of Tunde Omonode is now in comatose and on life support due to inefficiency, lack of vision and mismanagement of funds, despite the huge budgetary provisions by the State House of Assembly through the State Ministry of Information and Internally Generated Revenue accruing to the station. 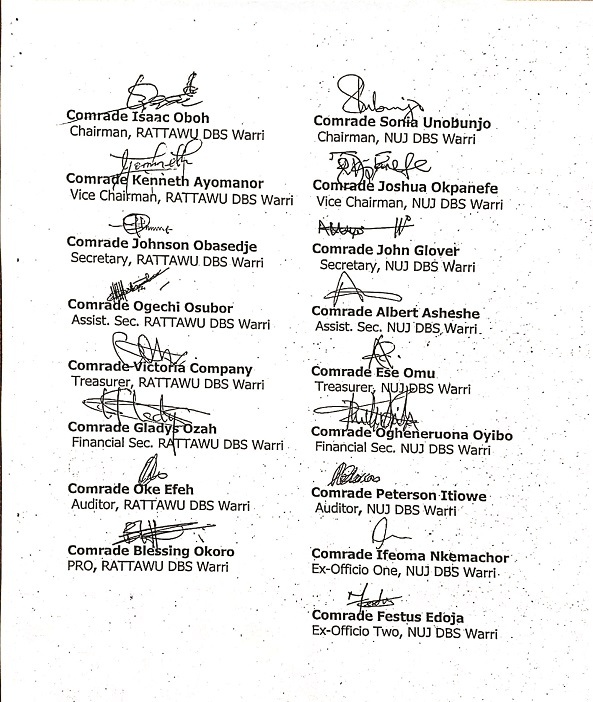 In response to the unions’ petition dated April 1, 2019, the House Committee on Information, Delta State House of Assembly, has invited the Delta State Commissioner of Information, Mr. Patrick Ukah, Mr. Tunde Omonode Igrammar and Chairmen of DBS Warri Chapter of RATTAWU as well as NUJ to appear before it on Monday April 15, 2019. 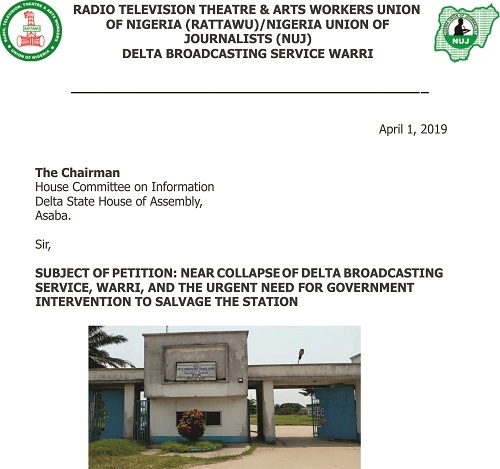 Your Soaring International Tabloid serves you blow-by-blow aspects of the petition, detailing the untold story of the emerging scandal rocking Delta Broadcasting Service, Warri. 1. DBS Warri that was once the pride and toast of the Delta State has become a subject of mockery due to the epileptic nature of its services, and the deliberate action of the General Manager Mr. Tunde Omonode Igrammar, to undermine the efforts of the State Government to make DBS Warri competitive in the broadcast industry. Currently, the few available vehicles have been grounded and materials needed to work are non-existent. Both the Television and Radio studios have become ovens due to dysfunctional air conditioners thereby reducing the life span of the broadcast facilities that are currently in a sorry state. The situation has become even more disturbing when the Radio station goes off air whenever there is thunderstorm. This is due largely to the absence of either thunder arrestor or deflector. It is embarrassing to note that smaller Radio stations within and around the Warri metropolis operate a twenty-four-hour service, whether it rains or not. 2. After twenty-seven years of existence, DBS Warri cannot boast of more than four functional video cameras for its operations. Instead of private studio owners and commercial cameramen running to the station to hire video cameras, the station in turn is the one going to them. Same applies to other working tools in the station. 3. The General Manager of DBS Warri, Mr. Tunde Omonode after seven years has taken the station thirty years backward. He has over the years arrogated to himself as the ‘Pharaoh’ of the station. DBS Warri Management is now Tunde Omonode as members of Management have become errand men and women. He has turned management meetings to more of briefings. 4. It is on record that his administrative style has shown that he has created an unenviable record to be the worst General Manager DBS Warri has ever had because there is nothing on ground to justify the huge funds invested by the State Government and millions of naira that come in monthly as IGR. 5. It is worthy of note that the General Manager of DBS Warri is appointed by the State Governor. It is of knowledge to the Unions of the Establishment that the appointment of Tunde Omonode as General Manager of DBS Warri has since elapsed. With his obvious lack of competence and capacity the Unions are concerned of his continued reign even when his tenure has expired. 6. To enable him perpetrate his clandestine financial machinations in the Establishment, he surreptitiously employed three casual staff as secretaries into the three key departments that control the funds of the station. They are; (a) Office of the General Manager (b) Accounts/Finance and (c) Marketing. This is all in a bid to cover up his fraudulent acts. Also, the Accounts Department is loaded with members of one family and friends who are staff of the station against the ethics of the job and the extant rules. Revenues from several commercial programmes and advertisements are paid into individual accounts belonging to the General Manager, Deputy General Manager/HOD Accounts/Finance and Deputy General Manager/HOD Marketing, thereby violating approved financial regulations. 7. Before his appointment, the Administrative Department was responsible for raising memos/vouchers, but this responsibility was transferred from the Administrative Department to Accounts Department. Currently, the Account Department raises vouchers and makes payments against established procedures, thereby allowing fictitious vouchers to be paid without passing through the Audit Unit for verification. The General Manager working in cahoot with the HOD Accounts/Finance is currently in possession of several vouchers they intend to retire upon the dissolution of the Board of DBS Warri to cover their tracks. 8. Consequently, the Internal Audit Unit has been rendered redundant despite several interventions for the General Manager to reverse the ugly development. To further raise alarm over this gross financial wrong doing, the Internal Audit Unit wrote to the Chairman of the Board of Directors to prevail on the General Manager and Accounts/Finance Department without success. 9. In order to intimidate staff and continue with his impunity, the General Manager had always boasted that the State Commissioner for Information, the Permanent Secretary of the Ministry and the Chairman and members of the Board of Directors are all under his pay roll hence, he is untouchable. The SEEMING CONSPIRACY OF SILENCE from the Commissioner for Information who is in possession of the Outside Broadcasting Van (OB VAN) meant for DBS Warri as a gift, the Permanent Secretary and the entire Board of Directors despite spirited efforts by both Unions to draw their attention to the decay currently being experienced in the Service, culminated into this petition. 10. It is worthy of note that, some past General Managers of the station have perpetrated their fraudulent practices that have affected the growth of the station following the expert financial recklessness, dubiousness and connivance of the Head of Accounts/Finance Department, Mrs. Augusta-Gold Okoro. To deal with the problems confronting the station particularly that of Management failure, the Unions want to strongly recommend will not be complete without her removal or redeployment alongside the General Manager. 1. That, the State Government investigates why despite the budgetary allocations approved by the State House of Assembly to the station through the State Ministry of Information, and the Internally Generated Revenue, IGR, DBS Warri cannot compete favorably with other industry players. 2. That, the State Government look into the continue reign of Mr. Tunde Omonode as General Manager of DBS, Warri, despite the expiration of his tenure as it has affected the station negatively. 3. Ascertain the complicity of the State Commissioner for Information, Mr. Patrick Ukah, in the wrong doings in DBS Warri. He is alleged to be in custody of the station’s Outside Broadcast Van (OB VAN) parked at his official residence in the Commissioners’ Quarters, Asaba. 4. Investigate why the recommendations of the DBS Warri Board of Directors that indicted the General Manager, Mr. Tunde Omonode Igrammar, for theft of the properties of the station was swept under the carpet. 5. Call for the immediate removal of the General Manager, Mr. Tunde Omonode Igrammar for gross incompetence, mismanagement and lack of focus to advance DBS Warri to meet up with modern broadcasting trends. 6. The redeployment of the Head of Accounts/Finance Department, Mrs. Augusta-Gold Okoro. As the financial expert of the station, she has over the years acted as a ready tool for the financial recklessness and fraud in the station. It is on record that due to her dubious financial integrity, she has had running battles with past General Managers of the station that did not succumbed to her whims and caprices. A typical case in question, was her running battle of supremacy with a former General Manager of the station, Mr. Willy Sowho, which culminated in her transfer by the then Board of Directors to DBS Warri Marketing office in Lagos. In that particular case, she was transferred based on her indictment in a Seventeen Million Naira (N17, 000,000.00) fraud. 7. Immediate restructuring of the Accounts/Finance Department to reflect the corporate interest of the station rather than a particular family spearheaded by the HOD, Mrs. Augusta-Gold Okoro. From the foregoing, it is clearly evident that the current General Manager and Management Staff of DBS Warri, have outlived their usefulness. The obvious setbacks in the station which was once a bride of Delta State cannot be blamed alone on the General Manager and Head of Accounts/Finance Department, as evidence abound of the incompetence and nonchalant attitude of the station’s Committee of Management to the collective survival of the station. As the Committee may be aware, staff of the station under RATTAWU and NUJ recently suspended a 3-Day Work-to-Rule to compel the Board and Management to address most of the immediate challenges affecting the progress of the station. At the expiration of the Work-to-Rule and with some interventions by the Board, the Unions gave a 14-Day ultimatum to the Management to fully address the issues that have been raised in the past one year. Without fear of any intimidation, both Unions are determined and with the full backings of the entire Staff of the station will on Thursday 11th April 2019, embark on a full scale strike to press home their demands aimed at repositioning DBS Warri for the better. The Unions and indeed the Staff of DBS Warri humbly appeal to the committee to fully wade into the affairs of DBS Warri to forestall breakdown of law and order should the Staff be forced to take their destiny in their own hands to avert the extinction of the station.